DOUBLE LIVE – RIAA certified for over 23 million units sold, DOUBLE LIVE is the best selling live record in music history. When it was released on November 17, 1998, it set an all-time record for the Soundscan era by selling 1,085,373 copies in its first week. This was not only a record for first-week sales, but for any one-week sales period by any artist. Like Ropin’ the Wind, The Chase, In Pieces, and Sevens, DOUBLE LIVE debuted at the top of the Billboard Top 200 and Country Albums charts, and it stayed at the top of the Billboard Top 200 chart for 5 weeks. The special 25th Anniversary Edition package contains two CDs with 30 songs and one DVD with 30 music videos. 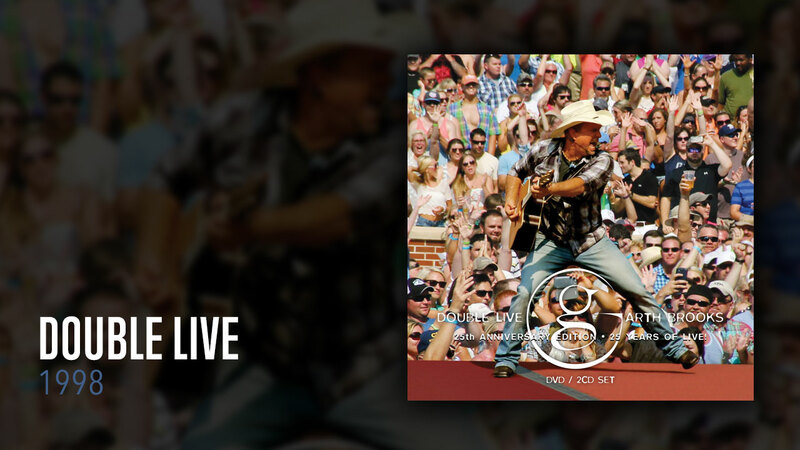 This collection, celebrating 25 years of Garth thrilling audiences with his live shows, was updated with new songs and videos including “More Than a Memory,” his 19th #1 single; “A Heart in New York,” the opener to the HBO special Garth Live From Central Park; “Good Ride Cowboy,” his tribute to Chris LeDoux from the 2005 CMA Awards, live from Times Square; “Workin’ For A Livin’,” the duet with Huey Lewis; and “Wrapped Up in You,” featuring a guest appearance by Keb Mo.